An Embroidered Casket – Celebrate this Finish!! There are embroidery projects, and then there are Embroidery Projects. 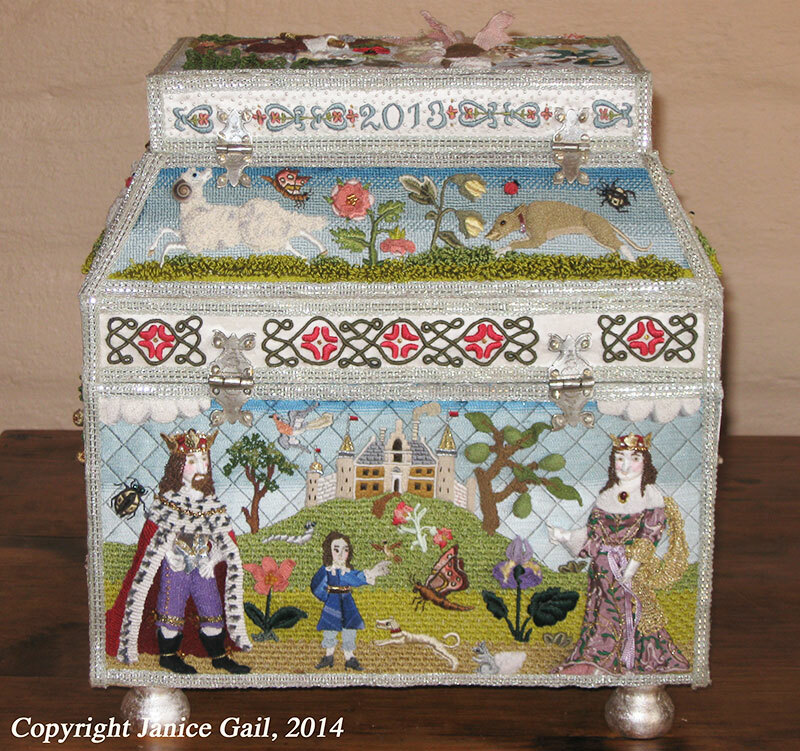 And Janice Gail’s embroidered casket is definitely the latter – an Embroidery Project Extraordinaire! Today, I’d like to share some photos of her masterpiece with you so that you have something enchanting to explore over the weekend. You can click on any of the photos below to make them larger. 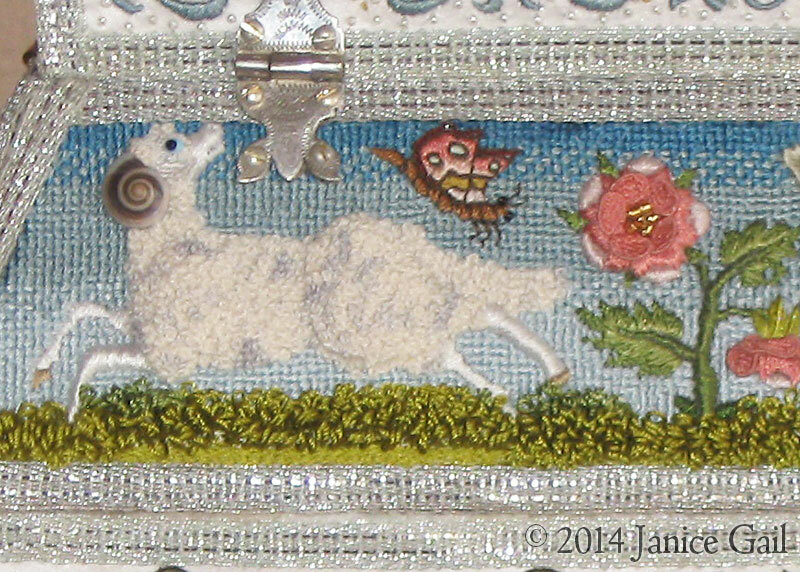 Janice’s embroidered casket is a result of her participation in Thistle Thread’s Cabinet of Curiosities class. The class is a two-part adventure that explores the 17th century embroidered casket in all its details – from the embroiderers themselves, the subjects they chose, the materials and techniques they used, to trimming out, finishing and assembly. The classes provide structure, instruction, and all the right materials for those who have nurtured the life-long dream of creating their own 17-century-style embroidered casket. Over on the Thistle Threads blog, Tricia will be writing about some finishes in the embroidered casket classes in the next couple weeks, so if this is your thing, you might look out for those upcoming articles. It’ll be fun to see how people have interpreted their own personal vision in needlework on their own embroidered caskets. 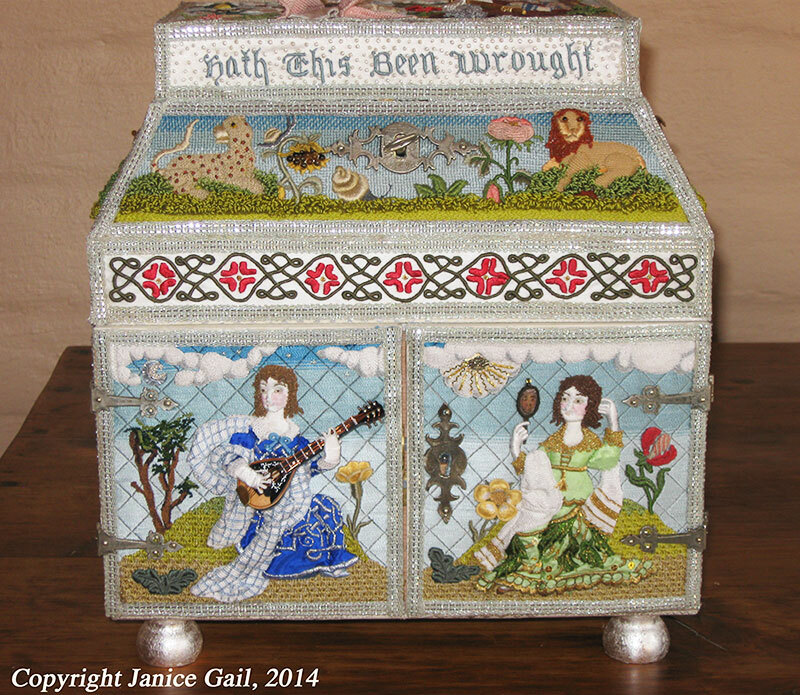 You can read about Janice’s embroidered casket and her design story here on the Thistle Threads blog. Projects like this captivate my imagination. They pull me in with every little detail! What I especially love about Janice’s work is that the parts are all so meticulously aligned to create the whole. The continuation of the colors, the sky, the greenery, the flora and fauna – they run through the various panels as leitmotifs that lend cohesion and interest to the whole. Completing a project like this is no small task – 4,000 hours of work went into this masterpiece! Imagine the dedication, the perseverance, the motivation to see a project like this through! At the same time, imagine the fun of it! Every panel, every inset, is a project unto itself. And in each panel, there is so much variety – all those little critters, the figures and their details of hair, of clothing and props, the flowers, the trees – so many little aspects to work on in each panel. These caskets remind me of the magic of exploring exquisite, finely detailed doll houses. I can’t help thinking how much fun dollhouse decorators have, collecting and outfitting their miniature mansions. And when I see a piece like this, that same sense of wonder and discovery is there, along with (to be honest!) a little tinge of envy of all the fun the creator enjoyed in the process! 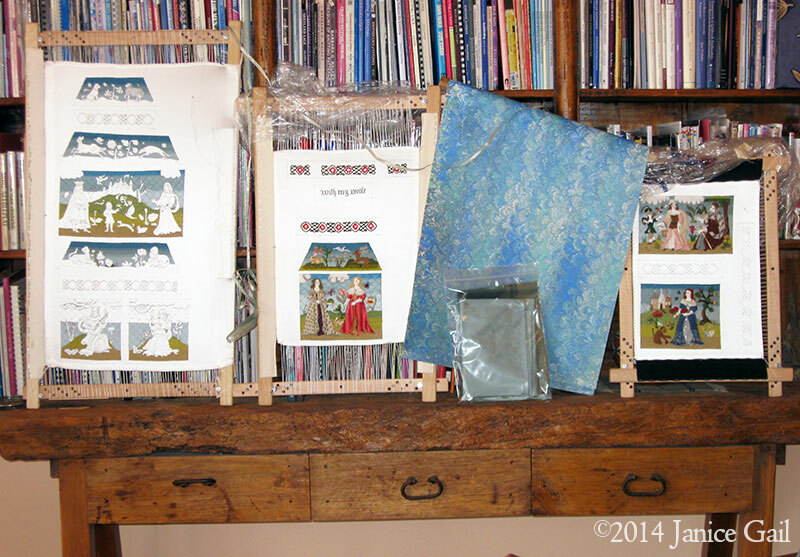 Above, you can see Janice’s casket set up on embroidery frames, with the work in process. I love, love, love this photo! It shows the scope of the project, the planning and the logistics involved in getting it all right. Bravo to Janice on an amazing accomplishment – it’s certainly a grand finish worth celebrating! And I hope you all enjoy exploring the photos as much as I do! And to all… a wonderful weekend! 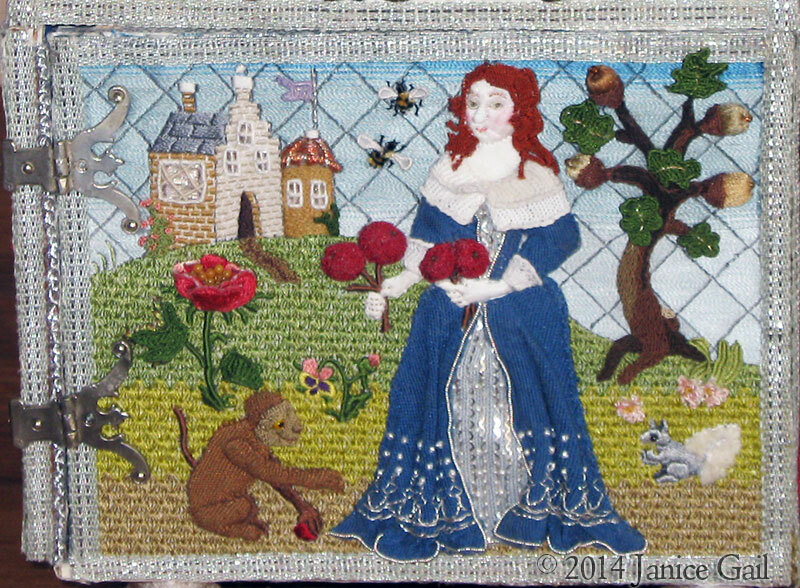 August 5, 2015 Oh, that Needlework Bucket List! It is beautiful. I’m guessing it was an item meant to be used. How did they use it without soiling all the fabric and needlework with their hands over the years? Or was that just to be expected? I see hinges here and there but only one knob. What a lovely item and so much work that went into it. Heirloom quality. Congratulations Janice and thanks for letting Mary share it with it-very inspiring. This is an amazing piece of embroidery and the casket is so beautiful and such detail. Imagine taking 4,000 hours to complete the project but what a wonderful keepsake. I really like the inside of the casket, the embroidery on the inside of the doors is lovely. Congratulations Janice and thanks Mary for sharing this with us and I hope you have a great 4th of July enjoy yourselves. I was looking at Thistle Threads just a few days ago and wondering about the caskets. This one is spectacular. Amazing work, Janice. Your project looks very complicated. Beautiful! And Happy Independence Day, Mrs. Corbet, and to all of you in the U. S. A. Hope you all enjoy your holiday! That is absolutely stunning. I’m wracking my brain, through the English language, trying to find appropriate words and I can’t find any. No word can adequately describe this work of art. So I’ll just say a totally inadequate WOW! That is amazing! What an accomplishment. Its so beautiful. I wish the headline had said “jewelry casket.” Of course I imagined a coffin. Everyone always does think of coffins, but you learn to get a chuckle out of it. You should have seen my oldest sister’s face when I told her what I was making! What an extraordinary and beautiful piece of work! But 4000 hours – the secret of SOS (without which I doubt anyone would embroider) is NOT to contemplate the amount of work before you embark on a project. Amazing, Stunning, it looks like it should be in a Norman Castle, or at leas a prop on an Errol Flynn Movie set! 😉 There’s one thing I can’t figure out… How does one install the panels onto the casket itself? Really beautiful, and I would think a very rewarding piece to complete. I love all the little details on it. I would love to see it in person. I think everyone else has already used any words I can come up with! What an incredible labour of love. Janice – Your casket is lovely! The reflection in the mirror is a really nice touch. I would love to take the course, but right now, finances, time and energy have me outvoted. That course is well worth the money, considering what you get in materials, instructions and learning. Previous Previous post: Little Flowers in Silk & Organza Ribbon – A Give-Away!